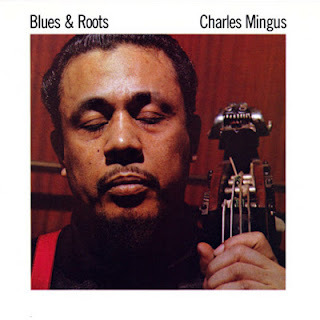 Charles Mingus Jr. (April 22, 1922 – January 5, 1979) was a highly influential American jazz double bassist, composer and band leader. Mingus's compositions retained the hot and soulful feel of hard bop and drew heavily from black gospel music while sometimes drawing on elements of Third Stream, free jazz, and classical music. Yet Mingus avoided categorization, forging his own brand of music that fused tradition with unique and unexplored realms of jazz. He once cited Duke Ellington and church as his main influences. Mingus focused on collective improvisation, similar to the old New Orleans jazz parades, paying particular attention to how each band member interacted with the group as a whole. In creating his bands, Mingus looked not only at the skills of the available musicians, but also their personalities. Many musicians passed through his bands and later went on to impressive careers. He recruited talented and sometimes little-known artists, whom he utilized to assemble unconventional instrumental configurations. As a performer, Mingus was a pioneer in double bass technique, widely recognized as one of the instrument's most proficient players. 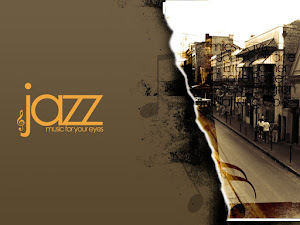 This album, "Blues and Roots", has been described as "technically difficult music that drips with rhythm and soul" and stands the test of 100's of listenings because of its amazing musicianship and beautifully, complex compositions. On every song it seems, you hear one perfect, funky line by one instrument, which is then combined with another completely different melody by another...and another and another, until you have 10 players soloing over each other without stepping on toes. "It's a prayer meetin' with brains!" This version also includes 4 bonus alternate takes. Charles "Charlie" Parker, Jr. (August 29, 1920 – March 12, 1955), also known as "Yardbird" and "Bird",was an American jazz saxophonist and composer. Miles Davis once said, "You can tell the history of jazz in four words: Louis Armstrong. 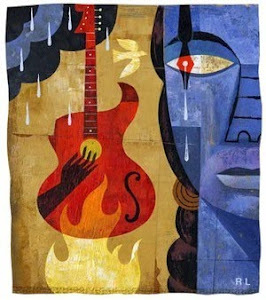 Charlie Parker." 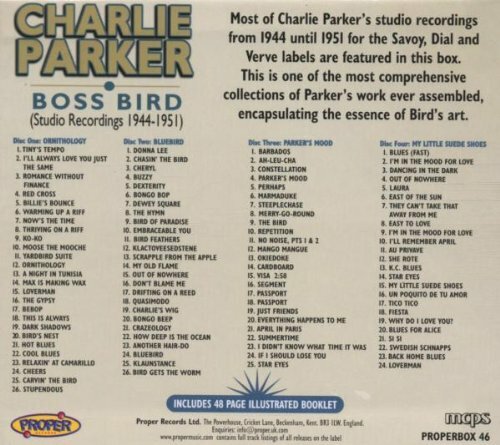 Parker acquired the nickname "Yardbird" early in his career and the shortened form, "Bird", which continued to be used for the rest of his life, inspired the titles of a number of Parker compositions, such as "Yardbird Suite", "Ornithology", "Bird Gets the Worm", and "Bird of Paradise." 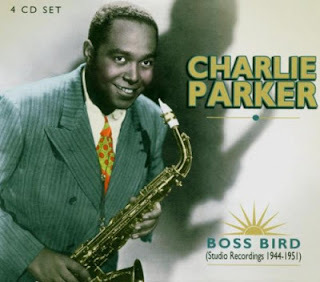 Parker was a highly influential jazz soloist and a leading figure in the development of bebop, a form of jazz characterized by fast tempos, virtuosic technique, and improvisation. Parker introduced revolutionary harmonic ideas, including rapid passing chords, new variants of altered chords, and chord substitutions. His tone ranged from clean and penetrating to sweet and somber. 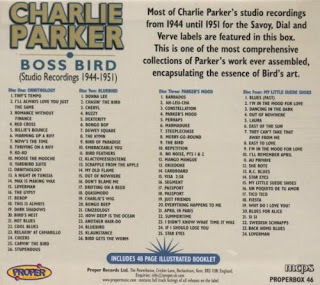 Many Parker recordings demonstrate his virtuoso playing style and complex melodic lines, sometimes combining jazz with other musical genres, including blues, Latin, and classical. Parker was an icon for the hipster subculture and later the Beat Generation, personifying the jazz musician as an uncompromising artist and intellectual, rather than an entertainer. This collection has almost all of Bird's studio work with masters from Savoy, Dial and Verve. 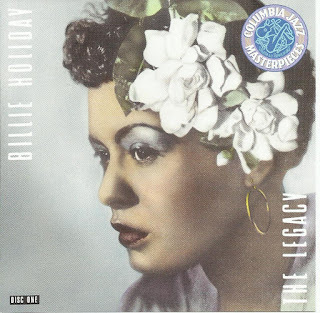 Billie Holiday (born Eleanora Harris, April 7, 1915 – July 17, 1959) was an American jazz and blues singer and songwriter. Nicknamed "Lady Day" by her friend and musical partner Lester Young, Holiday had a seminal influence on jazz and pop singing. Her vocal style, strongly inspired by jazz instrumentalists, pioneered a new way of manipulating phrasing and tempo.